5 Usurpation request for the account "Damon"
Usurpation request for the account "Damon"
As of late, I've grown sick of using pseudonyms, and I am using my given name more and more. To sum up my proposal, since I am rushed at the time, though I'll provide a compelling argument in a bit on request if need be, I want to replace the name "Eric Snowmane" with my given name "Damon", which as shown on the logs, was created on Sept. 1 2006, and has zero contributions, no userpage, no talk page, and no trace of existence on the wiki, save for showing up as a user created on this date. As I discussed in IRC with Velyanthe and AKB, it's a rather controversial move, especially if it were to be a relatively recent account that made the name, but for all intents and purposes, we can consider this account dead. If a consensus will permit me to have what is probably UESP's first USURPATION of an account. On the above linked page, it says "In order to ensure that usurped usernames be put to good use, we prefer only to grant requests from reasonably well-established users." While I have a connection issue that gives me long stretches of time where I am not here, I would like to imagine a nearly two year old veteran and patroller/blocker is someone who would actually use the account. Having just tagged a YouTube link for being used for spam, and after observing a few other instances over the last many days of my return, I recalled the topic I brought up in January suggesting that YouTube links be restricted on the site to minimize the their abuse as spam. The discussion never really received must of a glance-over by anyone, looking back at how few replies there were, so I thought I'd revive this, because there are still spammers using YouTube links in place of their other URLS. Oh, given my absence over the summer, if I did miss something actually happening, then my bad. Anyway, like I said in the long paragraph I wrote initially, save for very rare instances (so rare that none can come to mind) on talk pages, there are virtually no meaningful uses for YouTube links. Some wikis/wikias use video walkthroughs, but given the open approach to TES, there's no meaningful way to do something similar, and I find it rather unlikely that such a thing would ever be implemented, making the 99.9% of all YouTube links coming here to be either outright spam, or unhelpful posts of links for walkthroughs that can rarely happen. Can we resolve this issue and close off this outlet of spam? While I am all for newbies and numbers having their freedom to post as unrestricted as possible, for the integrity of the site, we really need to stamp down on these spam issues. The solution that I, RH70, and Lurlock seemed to like was that only auto-confirmed users be able to post these links unhindered, which would prevent them from being posted by bots. Is this something agreeable and doable, or are there other suggestions available? Few people ever post youtube links. However, we should not restrict link-sharing to autoconfirmed users, because then what happens to General:Links? If we copy and edit Special:AbuseFilter/2, we can make it respond to youtube/youtu.be links and pop up with a warning (not block the edit; the other filter works fine with just a warning). Alternatively, we could just remove youtube from the whitelist, which would give users a warning but allow them to go forward and post the link if they want (which bots almost never do). I am in support of this method. Autoconfirmed users still get a CAPTCHA, so they're not completely "unhindered". Dragon Guard has been a disruption to this site for far too long. Almost from his first edits there has been trouble trying to get him to follow wiki guidelines, policies, and rules, which he breaks time and time again. He is rude, unco-operative, prone to edit warring, has harassed and attacked other users, and refuses to acknowledge problems with anything more than a single syllable. I have personally had four other editors asking what can be done about this behaviour, beyond simply asking him to change. He has received two warnings that have stuck, received another two that were judged unwarranted (I bring this up to show the feelings of other editors), received a short block that was essentially a final warning to change, and is currently under a 1RR. (edit conflict) Per Silencer's argument, I can see a justified indefinite ban from the wiki, but being the nice guy I am, I'd suggest 3-6 months. He's a disruption and is prone to argument, especially over petty issues like that Investigator. That said, we all have our firm beliefs over the wiki, and I can remember getting into shouting arguments with Jak Atackka over months old issues that, in hindsight, I can't believe I was stubborn enough to argue about; including a few words that I am ashamed of, and if he wanted to, could have reported as attacking him verbally. I think we should give him a few months to cool off, let the current issues die out, and give him a chance to redeem himself. If he isn't willing to correct himself, we can just cut our losses and give him an indef after a brief probationary period after the ban lifts. I believe that though stubborn, he is only thinking for the best of the wiki when he argues so hard that each thing that interests him is thoroughly documented. I've been known to be the same way. I'm in the process of adding a few safeguards to try and automatically protect the site accident DoS (Denial of Service) attacks, whether accidental (i.e., trying to download an offline version of the site with a poorly behaving program) or on purpose. Most of the random slow downs in the past few months are directly linked to a single IP spamming 100s of connections in a very short period of time. This eventually uses up all the Apache instances and the site becomes slow and ultimately unresponsive. So far I've added a 20 connection limit for each IP address on Squid. It doesn't appear to break anything (the vast majority of users use less than 10 active connections at a time) but let me know if you notice any thing breaking. I'll be looking at adding more sophisticated DoS measures in the coming days and weeks. In preparation for upgrading MediaWiki once again I'm upgrading the content servers from PHP v5.2 to v5.3 (which turns out to be much more difficult as usual). I've done the upgrade on content3 already and found a few minor issues I've fixed. I'm finally making progress with updating the site's Google maps. The v2 maps API we use was deprecated by Google a while ago and is being taken down next month. A while ago I tried updating our maps to v3 using the existing code but there was too many changes between v2 and v3 and I didn't make much progress. This time I've started from scratch and added/reused the existing code piece by piece which was much easier in the long run. Fixed Map label positions aren't working (they are all bottom-left aligned to the marker). The label/marker system is completely changed in v3 and I'm still working on it. The overall page style has been changed significantly. Comments and ideas welcome. I'll probably play with a few different styles/color sets that match the style/colors of each map. Done but needs testing. Note the addition of separate sub-domains for each map. The other maps have to be upgraded to v3 (minor work since 99% of the code has already been upgraded). A better map editing interface has to be done. Better integration of the map into the wiki. I'll probably keep the standalone pages but to have it nicely work within the wiki (including an editable map). Done. Packing/compression of all the JS/CSS into fewer files. For ease of development there are many JS/CSS files but once the map is "finished" they can be packed and combined into one JS and one CSS file. Initial version done (needs feedback). A mobile skin. It does work on mobile devices but the text for map labels and search results is very small. Added cell grid display option. Updated the map help including creating the Map Help article. Done. Need to add other map icons. Update -- The majority of the maps upgrade is done and the maps appear to be working well other than a few minor tweaks. I still need to play with the mobile skin but at least its usuable (unlike the prior maps which don't work well or at all with mobile devices) and some of the other items I have yet to work on but are mostly separate tasks (better wiki inclusion and map editing in particular). Unless there's any significant issues I haven't noticed I'd like to switch to using the new maps sooner rather than later. The old/existing maps can be kept up and we can just change the necessary links to each map (assuming this is relatively easy). I can eventually forward the old maps to the new ones in a few months. I would prefer you use the XXmap.uesp.net direct link but www.uesp.net/maps2/XXmap/XXmap.html will also work. Noticeable color difference between tiles along the Western edge of the map and a few other places. Some of this may not be easily corrected. Legibility of the map labels needs to be tweaked a bit. More map tiles needed along the West and East edges of the map. Make the out of range map tile a more solid blue color. The map tiles were exported in batches of 5x3 cells and there are a few artifacts that need to be fixed (like here). This likely just requires the CK to be set to load cells 7x7 at a time and then re-export all the tiles. 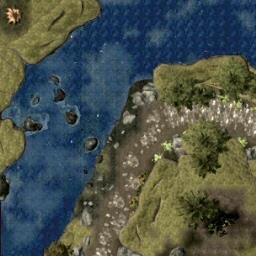 Remove all the sound markers along the Northern shore (some have been removed already). Figure out a way of hiding all the actor models (small white/green/yellow/red markers slightly visible at the highest zoom level). Map Color -- Making the tiles a bit darker, especially the white snow, might be good and help with label legibility. Artifacts -- If you notice anything on the map that needs to be hidden/removed let me know the position. This includes things like Dragons (removed a bunch) and acoustic spaces/markers that may have been missed. 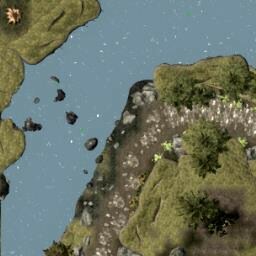 Water -- I can export the map with and without water which means we can pretty much do any water effect we want like tweaking the color or partial transparency (just have to figure a way of doing it all automatically). Larger Zoom -- Is one more zoom level needed? Not entirely easy to do mainly from the length of time needed and the fact the process is still partially manual. Holy crap that's an epic colored map. Wow. I don't think there's a big issue with the color--I really like it as it is, and like AKB said, you can click on any place to get a popup with info. An extra zoom level would be awesome, but definitely not necessary due to the amount of detail already there. There's dragons at -72182, 54478, -10116 and 3459, 96890, -10878 and 173660, -124359, 17320 and -3043, -43338, 6080. Mammoths at -39379, -18164, -5479. I've managed to make the capture process through the CK entirely automatic which makes it easier...just don't ask how. Given the former point I'll be capturing a larger zoom level (about 18 hours of capturing tiles depending on how many times the CK crashes). I've set the CK to load 7x7 tiles at a time and capture the center 5x1 tiles at 512x512 per cell and then split them into 256x256 tiles. This gets rid of all the edge issues in the current tile set. I've deleted all objects that cause issues (Actors, sound markers, etc...). The remaining few things that sneak through can be dealt with manually. I'm playing with a few post-processing water effects with some subtle transparency. (←) Personally, I prefer the look provided with WaterTest6 for the possible option with opacity. Basically I want the objects underwater to be the same shade, as a user looking at it would expect them to since the object are going to be evenly distorted by the water. And perhaps I'm just not seeing the obvious option, but I'm currently missing the ability to toggle the night version of the map. Speaking of possible bugs, a user reported the inability to see past the first 50 search results on the map. I am suffering the same issue, so it's not isolated it seems. I'm not sure if this is a general issue with the update, but I thought I would bring this to your attention if it wasn't already. and so on. I'd start with the top left as whatever the top left cell in the map is, not actually (0,0). I would still need a list of all the doors in the cell and where they lead, but the CK doesn't seem to have an option to export that data like it does for the info on where things are found. I have to manually export each individual thing's usage data, too; I can't decode the skyrim data files and this is faster and easier than trying to figure out how. The TES5edit precursor that I mentioned earlier dumps into a 1.9GB txt file that I can't do anything with because it's just plain too huge, and it also doesn't seem to include information about where things are; just what they are. I've included the scripts themselves in the data I sent; they're just reformatting though. The data extraction is done via the CK; pressing ctrl-f5 while a table is selected will export that table to a list of values separated by "\t\0". It's rather tedious, but the only method I could find without trying to actually decompress and decode the raw data--and possibly scan through ALL of it, as there likely isn't an easily accessed list of where things are found in the actual data itself. Esta página foi modificada pela última vez à(s) 23h51min de 4 de fevereiro de 2014.